What makes the Chevrolet throttle position sensor problem such a big deal? It's the amount of vehicles driving around with the pending issue. 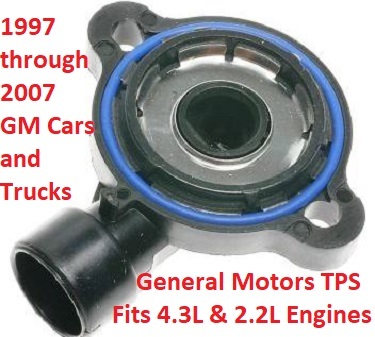 In an effort to save manufacturing costs General Motors used the same part number TPS sensor on a decade's worth of vehicles that utilize the 2.2 L four-cylinder engine or the 4.3 L V-6 engine. And there's nothing wrong with that. However, if you think about the amount of vehicles this includes, we're talking about more than 1 million units rolling around with a factory installed throttle position sensor that probably won't make it to the junkyard. Surprisingly, the little plastic part holds up for a long period of time, but they won't last forever. In this brief article we’ll discuss the symptoms associated with a TPS sensor that’s starting to fail. Take a look at the two info-graphics further below on this page. They explain the simple 3 wire operation of the circuit. In addition, we'll talk about a few diagnostic steps you can take to verify this part is the root cause of all your problems. Finally, we'll talk about making a decision on the replacement parts. We cover aftermarket availability and why I am currently leaning towards a factory type AC Delco replacement part. In an ideal situation do-it-yourself mechanics will own a simple auto scan tool to verify proper operation of the throttle position sensor before replacing it. You pull the percentage data up on the screen and watch it increase as you depress the throttle. However, on vehicles approaching 10 years of age or 100,000 miles owners might be able to skip extended diagnosis. We'll talk about this in the next two sections. And I just added a TPS sensor wire diagram at the bottom. Most people realize that a throttle position sensor reports the position of the driver's foot on the gas pedal. As the driver opens the throttle plates for more power, the computer increases injector on time to supply more fuel to the cylinders. This is how fuel injected engines meet the power demands of the operator. What many do not realize is that this throttle position data is also used by the power train control module to determine shift points for the transmission. The problem arises when the computer thinks that the throttle remains closed when it's actually open. This can cause the automatic transmission to hang in gear and bang hard as it shifts to the next one. As one might expect if the driver pushes down on the throttle and this action is not reported to the computer, a severe hesitation and lack of power will remain a primary complaint of the driver. As I mentioned in the opening section the Chevrolet throttle position sensor problem doesn't always require diagnosis. In fact, I replaced this part enough to keep one in stock. Whenever I find a check engine light code P0122 set in the computer's memory along with the symptoms of hard shifting and lack of power, I know to head right for the TPS sensor mounted on the throttle body. Note that these TPS sensors often provide intermittent operation when they first start to go. In this situation a check engine light code P0124 often sets in memory and we’ll discuss this in the next diagnostic section. The Chevrolet throttle position sensor is a variable resistor. The 5v reference signal sent from the vehicle's main computer feeds through a resistor before heading back to the module. The wider the throttle is open, the more resistors the reference signal travels through. The return voltage to the computer provides exact real-time data of throttle position. Not only is the Chevy TPS sensor a variable resistor, but it is actually of the potentiometer variety. Many are familiar with a (Volume Pot) potentiometer, because it acts as the volume knob on all of our radios. Now I mention this because this is where the rubber meets the road. Have you ever turned up the volume on an old radio and heard the crackling sound as the potentiometer malfunctioned. Sometimes you can even wiggle the volume knob and have the sound level increase and decrease. It's the same type of failure with a Chevrolet throttle position sensor. 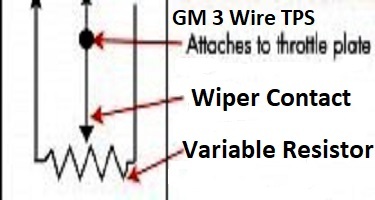 The delicate wiper that travels over the resistor coil starts to stick and perform poorly. This can provide the wrong data to the vehicle's computer. The power train control module has a diagnostic routine that lets it examine the data received from the TPS sensor. When this data operates outside of the recommended range the PCM turns on the check engine light. As I mentioned, one of the most popular check engine light codes that you will find is the P0122. This stands for throttle or TPS sensor circuit low. In this scenario the computer thinks the throttle is either closed or less than its actual position. Another popular check engine light code you might find becomes the P0124. This stands for the Chevrolet throttle position sensor intermittent operation. As we discussed at the beginning of this article one of the most amazing aspects of this problem becomes the sheer number of vehicles involved in the malfunction. I'm talking about 10 years worth of cars and trucks with the 2.2 L and the 4.3 L V-6 Chevrolet engines. Some of Chevrolet's most popular cars of all times fall within this description. The Chevy Cavalier that later turned into the Cobalt sold in huge numbers. The 4.3 L engine found its way into Chevrolet's work truck lineup. The Silverado 1500 and the Silverado WT both utilize the sometimes troublesome Fuel Injected 4.3 L V-6 gas engine. I say the word troublesome, because I just replaced the 4.3 L plastic distributor installed at the factory. However, the few problems associated with this workhorse V-6 engine actually stem from the mileage it's capable of accruing. I've seen this engine when more than 300,000 miles showing on the odometer. Expecting a plastic part the size of this throttle position sensor to survive the heat of the engine compartment for such a length of time seems unrealistic. When you remove the three retaining screws from a TPS sensor on a Chevrolet product you will likely find that the blue silicone seal from the factory deteriorated. Not only does this allow moisture to enter the sensor, but it also causes the potentiometer to bind as the throttle plates open and close. The one thing that I wanted to mention before you tackle this do-it-yourself auto repair remains the quality of parts available. With the demand extremely high for these replacement parts, aftermarket companies stepped up to the plate and flooded the market with cheap components. After having a few of these not work directly out of the box, I decided that I better stick with the AC Delco parts. With that said, your results may vary. I want to direct your attention to a few related articles. When we talk about the Cavalier with the 2.2 L four-cylinder engine or the Chevrolet Blazer with a 4.3 L V-6 engine, there's a few other problems common to these vehicles. The 4.3 L V-6 engine remains known for breaking Chevrolet engine mounts. And the Chevy Cobalt makes a popping sound that could drive you completely crazy. For more information about what else this site covers visit the fix my old ride.com homepage.